The overclockers DirectX 11 card of choice? Absolutely not a card for everyone, but if you want to tweak it, there's none better. After decent gaming performance from your next graphics card upgrade? 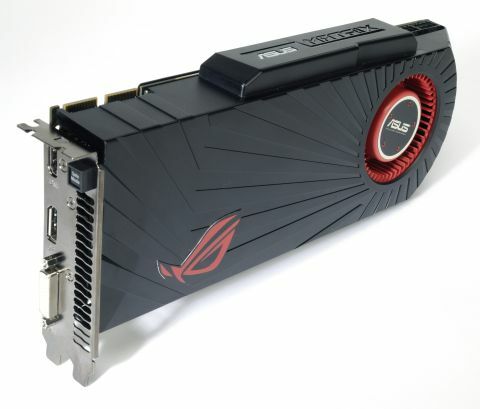 Don't even think about buying the ASUS' latest Republic of Gamers Matrix HD 5870, then. Any standard, off the shelf AMD Radeon HD 5870, like the HIS reference model which costs just £320, will happily run any game you can throw at it at a high resolution and decent framerate. If you want just 'decent' performance, Asus' Republic of Gamers don't want your money. Even if you want a super-tuned HD 5870, the Gigabyte Super Overclocked edition is faster. If, and only if, you're the kind of person who enjoys torturing silicon until it screams by increasing clockspeeds and voltages purely for the hell of it is the Matrix the card for you. With an improved heatsink, custom parts and PCB, and software apps that let you overclock the Matrix harder than any other GPU out there, this is a card that begs to run faster.